Ameripan ♥. "Even on opposite ends of the Earth...I'll still upendo you.". Wallpaper and background images in the Hetalia Couples! 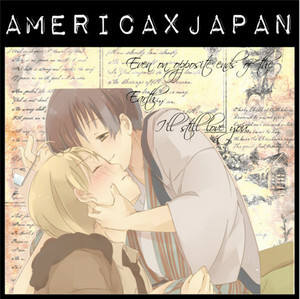 club tagged: photo ameripan alfred f. jones kiku honda hetalia. "Even on opposite ends of the Earth...I'll still upendo you." This Hetalia Couples! photo contains anime, comic kitabu, manga, cartoon, and mkono. There might also be gazeti, karatasi, magazine, tabloid, rag, jarida, tabloidi, and limemalizwa.